Did you know you can paint with watercolor on gesso? I learned something new this week in my online class with Junelle Jacobsen. 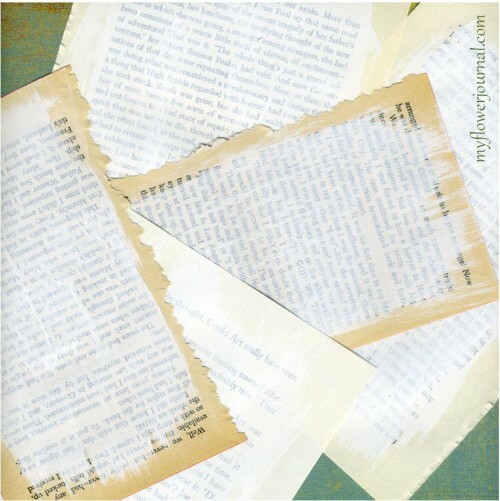 She spread gesso on old book pages for some of the projects she has showed us. I have used gesso many times for multi-media projects, but I din’t know you could paint with watercolor on it. What a great thing! I love the texture and look of the book print under the gesso with a watercolor sketch over it. I was surprised the pages dried flat after brushing the gesso on them. I suggest you spread gesso on a bunch of old book pages. That way you have plenty to create with. I used a sponge brush to apply the gesso. Make sure you do it thick enough for a good base to paint on, but thin enough for some of the book print to show through. I did a variety of book pages that were different sizes and colors. After the gesso is completely dry I lightly draw my sketch with pencil. Then I go over the pencil with a waterproof pen. I like the black sharpie pens, not to be confused with sharpie markers. Next I carefully erase the pencil if it shows. You can’t erase very hard or you will damage your gesso surface. Watercolor as you usually would. When its dry I usually add a few more pen details and some splattered paint in watercolor or acrylic. Splattered acrylic paint is much heavier and gives the look of a grassy field. Splattered watercolor is just little specks and dries quite light unless you use a lot of pigment mixed with the water. Here’s a couple of watercolors I painted on gesso spread on old book pages. 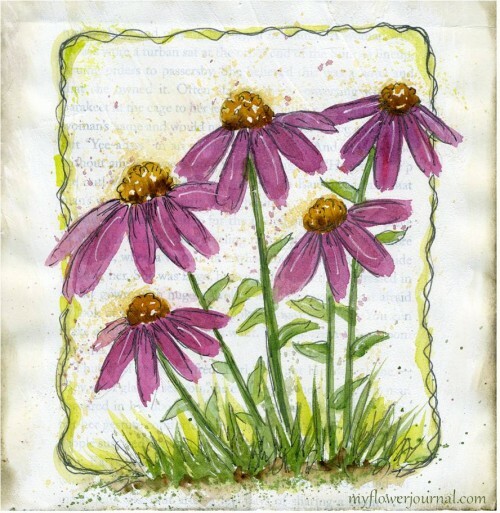 Purple Cone Flowers splattered with watercolor paint. 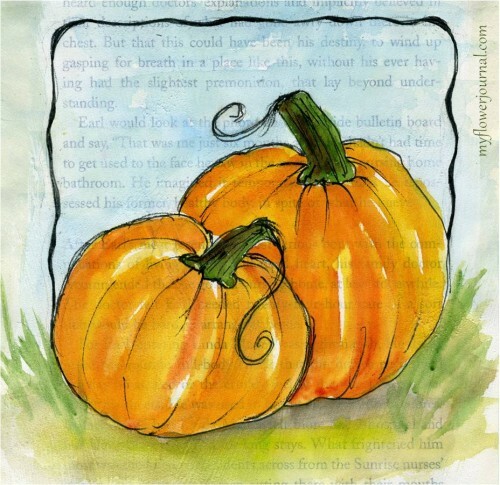 Pumpkin journal page before the splattered paint…. 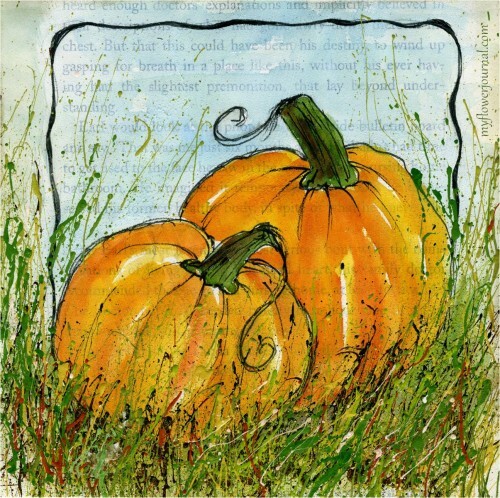 Watercolor pumpkins in a field of splattered acrylic paint. I splattered dark green and brown first, then a variety of lighter greens followed by orange, yellow and white. 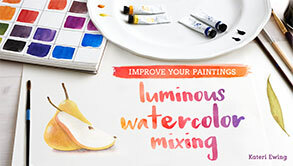 If you are new to watercolor painting or want to take a great watercolor check out this one on Craftsy. If this class had been available years ago I could have saved a lot of money on paint. I now use the Daniel Smith Essentials Set (a limited palette) plus a few favorite colors for most of my watercolor projects, but there are times when its nice to use premixed colors like the ones found in the Koi Watercolor set. I really love this idea, and your “sketches” are beautiful. I especially like the effect you created with splatter on the pumpkin page! They are so beautiful!!! I want to try it. What a beautiful effect! Love the pages. So nice to know you came by! Beautiful work! Love the splattered look! Can’t wait to try this on the book pages. We used gesso on canvas paper in watercolor class and I LOVED working with it! You can “erase” a mistake with water anytime. I did that after it sat for a month. Hi Tammy! Your watercolor flowers and pumpkins are so pretty! I learn so much from you! Thanks for sharing your knowledge and experience! Blessings from Bama! Your watercolors over Gessoed book pages are magnificent! Tammy these pages are gorgeous!!! Your sketching and watercolor style are just fab-you’re so inspiring! Love the pumpkins! What a pretty finish the pages make! Visiting from Be Inspired! I love your lovely water colorings! What a wonderful gift you have to create such pretty painting. I have wanted to try gesso on furniture. I think it makes a great texture on everything it touches. Gorgeous and inspiring. I hope I can sneak in some art time during this busy end-of-year season! All your watercolours are pretty, but that last one with the added splattered effect is my favourite! Such movement of the grasses in that field! Wonderful! I love the book pages for the background Tammy. another fabulous project! Very nice work. I love using watercolor over gesso — you can get some great textures with it! Gorgeous tutorial…love the pumpkins and the flowers! Have you ever tried black gesso? …you might like that too! I have used gesso on wood items and pretty much anything I want to cover up…but letting the lettering shine through is a fabulous idea! I’ve only ever played around a little with watercolor on gesso, but it certainly didn’t come out as beautifully as yours! I think I also need to find a smoother gesso, mine is quite rough! Happy PPF! pretty. I love this technique as well. Pretty pink/purple flowers – reminds me of Martha Lever’s flowers – nice work. Totally gorgeous paintings. :) Love the pumpkins! The paintings are luscious. Very bright and detailed. Every on of your paintings are so pretty – isn’t it great to learn something new and just have fun with it. I didn’t know that you can use watercolor over gesso. Thanks for the tip! Nice paintings. Your flowers and pumpkins look very beautiful on those book pages! These are beautiful. I especially like the pumpkins in the long ‘grass’. I really enjoy reading your blogs and looking at your beautiful creations. Fabulous and inspirational.